District Attorney Summer Stephan and the mother of a woman allegedly killed by her boyfriend nearly two years ago in San Diego asked Tuesday for the public’s help in tracking down the former Marine from Arizona, who’s believed to be on the run in Mexico or Central America. A reward totaling $11,000 is being offered for information leading to the arrest of Raymond “RJ” McLeod, 34, who should be considered armed and dangerous, according to authorities. 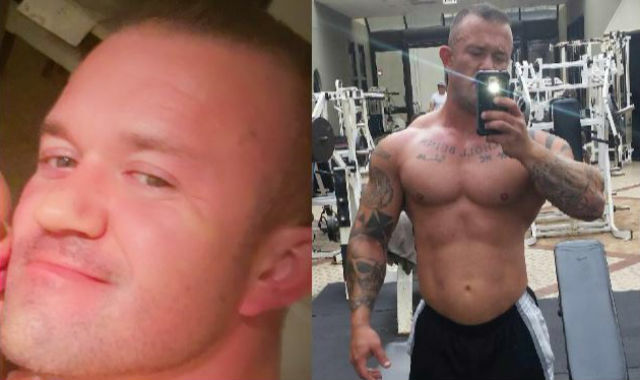 McLeod was initially characterized as a “person of interest” in the June 10, 2016, death of 30-year-old Krystal Mitchell, but authorities later charged him with murder and issued an arrest warrant. Mitchell, a divorced mother of two from Phoenix, was found dead at the Allied Gardens apartment of an acquaintance in the 7600 block of Mission Gorge Road. Police said she was last seen with McLeod, also of Phoenix, who left the area in a white four-door car that was later found abandoned near the border. Mitchell’s mother, former Detective Josephine Funes Wentzel, has been at the forefront of the search for her daughter’s alleged killer. “Catching McLeod will not bring my daughter back, but would prevent this monster from killing someone else’s mother, daughter or sister,” she said at a news conference at the D.A.’s downtown office. McLeod typically goes by the names “RJ” but could be using the aliases “Matt” or “Mateo,” authorities said. He’s described as 5-feet-11 inches tall and weighing 215 to 245 pounds with a bodybuilder’s physique. He has brown hair, hazel eyes and tattoos covering both arms and his collarbone. A television station in Belize reported last September that McLeod had been spotted there and in neighboring Central American countries, including Honduras and Guatemala. Wentzel told the Belize news outlet that her personal investigation had led to contacts in the small English-speaking country on the Caribbean Sea who had seen McLeod “all over Belize.” She said it’s believed he stays in areas near the coast, like Punta Gorda, where he can take boats in and out of the country without attracting attention. In late 2016, the U.S. Embassy in Belize issued a bulletin to law enforcement officials and media outlets there to be on the lookout for McLeod.